The Galena River, north of Benton, is a classic southwestern Wisconsin stream, often framed by bluffs on one side and cow pastures on the other. Gauge note: There is no gauge on the Galena River until farther downstream, but use Platte River at Rockville, or Pecatonica River at Darlington, as proxies. Time: Put in at n/a. Out at n/a. The fall of 2016 has been criminally delightful for paddling. By that I mean we have experienced classic climate-change weather conditions, of temperatures in the high 60s in late October and early November. I decided to indulge in some guilty pleasure to explore some streams and stream segments, unknown to me and (seemingly) not well known to other paddlers. I was on a quest this day to paddle what would have been my third Menominee River in Wisconsin. The other two are of course the Menominee border river between Wisconsin and the Upper Peninsula of Michigan and the Menomonee – yes, spelled differently – in the Milwaukee area. With that not possible, I hunted for something nearby in that southwestern corner of the state that I hadn’t done before, and tripped across the Galena River. I rightly assumed the stretch I traveled hadn’t been honored by a www.milespaddled.com entry, so here it is. Clearly this river needs adequate flows to enjoy, from what the previous entries have described. But I wonder if working the upper reaches of the river might actually be easier from a flow and water volume point of view, because the river is narrower and therefore less spread out. While I scraped my Pungo 120 a few times, I never got stuck and never had to get out of my boat to dislodge myself. I cruised right along. This stretch of the Galena is not unlike what one finds in most streams in this part of the state. You are flowing through bottomlands, with sedimentary-rock bluffs on one side of you, fields or pasture on the other side, and high hills and ridges in the distance. It all looked glorious in that sweet yellow light of fall. I saw some of the nicest examples of unaggregated sedimentary rock that I’ve ever seen. It was as if the inland sea that laid down those layers had dried up only a few hundred years ago. Some of the rock slabs tenuously clinging to the bluffs seemed ready for a backyard patio, without any alteration. Because it hadn’t rained in a while, the water was clear and clean-looking. The river bed here, as in many of the streams in this region, is rocky – nice to walk on if you have to. The river meanders gently back and forth, with just enough riffles between more-slack sections to keep you awake. Other than the distant thrum of the corn harvest, I encountered no one – it is delightfully remote here. Whether I was trespassing or not at the take-out at Bean Street Road wasn’t clear. There is a well-maintained snowmobile passageway over the barbed-wire fence and a simple bent-stepladder-like stairway over that same fence, intended for fishermen. There is a “No Trespassing” sign there, yet there is also a DNR “Public Fishing Only” sign. I took advantage of the ambiguity and dragged my kayak up and over the snowmobile bridge (which you would access if you take out on river left, downstream side of the bridge). You can’t get away from cattle in this part of the state, and while I didn’t have the close and uncomfortable encounter that Timothy experienced on the Galena River III trip, I did have to deal with single-strand electrical wires strung across the river at three different spots. The first one I sailed under easily. The second I touched to see if it was live; it was (it’s a tingle more than anything, not a jolt and not painful). The third I lifted with my paddle and got underneath it. I can’t say I found them annoying; they were much less intrusive than some of the fences and obstacles farmers put up that I’ve encountered on other streams (remember, if you can pass under it or get around it easily, it is not an illegal barrier to navigation in Wisconsin). Also, all cows (I saw just one herd) maintained a safe and unthreatening distance. I put in at Twin Bridge Road but next time I would start upstream of that spot, near Knee Deep Road (a road that can’t be named for the river itself here) for two reasons: You would get another 45-60 minutes of paddling in, making the trip to this part of the state more worth your while, and the actual put-in (though not at all “official”) is far better than at the bridge at Twin Bridge Road. Knee Deep Road does not cross the Galena, mind you; you park at a right-angle turn in that road and look for a gully that meets the river at a gravelly spot (be sure you are getting in the Galena, not the nearby Madden Branch, which goes under Knee Deep Road). The Galena River, north of Benton, is a classic southwestern Wisconsin stream, often framed by bluffs on one side and cow pasture on the other. The occasional riffles on this stretch of the Galena make for easy and fun paddling. 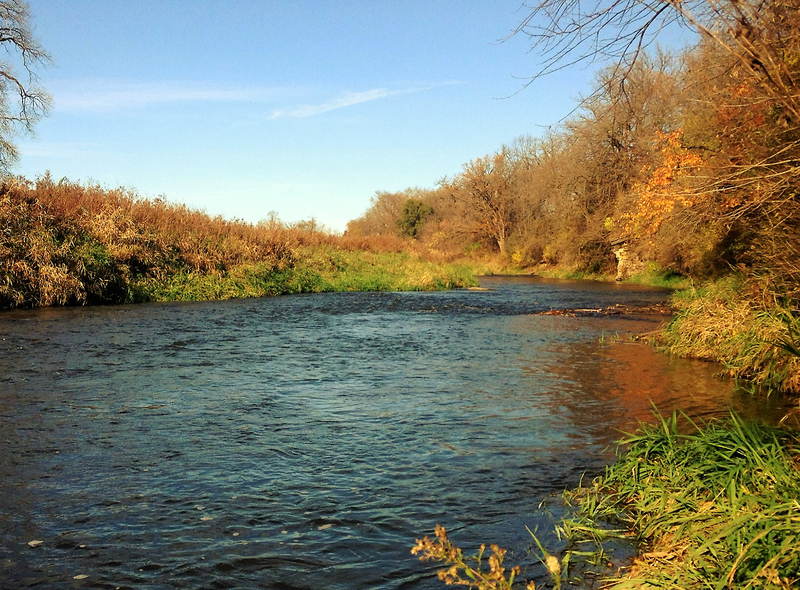 You can’t beat a nice fall day in Wisconsin for paddling a river. Late afternoon glow on the Galena River, north of Benton, Wisconsin. You could take advantage of this snowmobile overpass at the take-out at Bean Street Road. The “No Trespassing” sign must be intended for deer who don’t want to jump the barbed-wire fence. This ladder is just a few yards from the snowmobile overpass and is intended for anglers to get access to the river. There is a sign nearby that says, “Public Fishing Only,” indicating that creatures other than cows or the landowner access the river here. Though this is not the put-in I used, (at Twin Bridge Road) it’s the access I would recommend, near Knee Deep Road. You would be trespassing, in all likelihood, using this small gully to drag your boat down to the water from the road. (This spot is about 30 yards from the road.) But you can’t possibly harm anything.